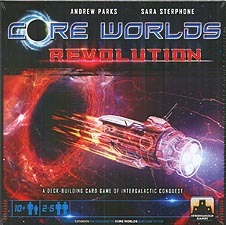 Core Worlds Revolution allows players to delve deeper into the story of the Core Worlds universe. Players can now build incredible Advancements on their conquered Worlds, including Cosmic Terraformers, Wormhole Generators, and Dark Energy Power Cores. Players can also employ Hero Tactics keyed to specific Heroes, such as Baron Viktor's "Sacrificial Lambs", the Promethian Cyborg's "Accelerated Procurement", and Queen Alais' "Warrior Queen". Each Hero commands 3 unique hero Tactics kept in a separate Heroic Deck beside the players' regular draw decks. This expansion also features 3 new Heroes (Captain Alexander, The Prophet, and Duke Magnus), each complete with his own set of Heroic Tactics. This is an expansion and requires the Core Worlds base game to play.